A few years ago we spent a sabbatical time at a genome center outside of Cambridge (called the Sanger Centre). One of the young post-doctoral scientists in the lab group where I was working was a chemistry PhD from Cambridge, who had a very distinguished record. 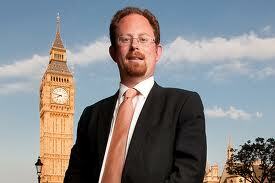 We met Julian Huppert, and even some of his friends and family, but on social occasions. We knew he had an interest in politics -- in fact, he was on the Cambridge City Council at the time -- but our interactions were strictly friendly and scientific. However, after we returned to our jobs in dull State College, we learned that Julian was standing for Parliament in Cambridge, as a Liberal Democrat (that is, his politics are the right politics, even if the party has colluded in the coalition with the Tories and hasn't a chance of having a majority). Anyway, now the world is a-buzz, or perhaps we should say a-Bose, with stories about that cute little Higgs Boson being found hiding so tightly inside other particles that it's not been seen but only guessed at. But most of us poor mortals who haven't seen Bosey haven't understood the poor fellow, either. Now thanks to violent collisions that literally knocked him out of his particular hiding place, everyone wants to know just what it is that we saw. We were happy to see our acquaintance in the news, and described as the smartest member of the House of Commons! And then interviewed on the BBC where, using his scientific acumen, Julian explained a bit about Bosey and a bit more about why we ought to be excited that he (Bosey) has been flushed out of hiding. Mr Huppert, MP sounds authoritative, and he knew some chemistry at least not so long ago, so we must believe him. After all, it's not every day you see someone you sort of know, with the nation in his tight grip, and a politician to boot, say something that actually sounds like a straight, even an honest, sentence. I had to scramble to find out where that's from, as I didn't remember it at all. But now I'll get out my CD and listen to it. The thing about Parliament is, these days at least, one can make fun of it. Unfortunately, there's nothing funny about our Congress, but a recent authoritative survey showed its sum total IQ had recently fallen below what we might now call the "Boson factor": lower than average, by '5 sigma'.